The Blennerhassett rose to prominence during the Gaslight Era, as oil and natural gas elevated Parkersburg’s riches. The hotel’s elegant decor reflects its late-1800s origin, including lavish crown moldings and extravagant light fixtures, a period library and a third-floor atrium sitting area at the heart of the hotel, bathed in natural sunlight from a skylight two stories above. The hotel’s attention to detail carries over to its signature guest rooms and suites, which are outfitted with granite vanities, marble showers and exquisite linen. But its impeccable staff—attentive, informed and helpful—makes Blennerhassett the place where past and present merge, and all your needs are effortlessly satisfied. 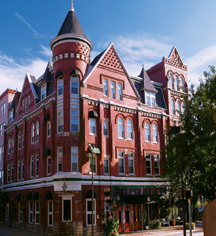 The Blennerhassett Hotel, a member of Historic Hotels of America since 1991, dates back to 1889. Guests experience a fusion of past, present and future whether enjoying dinner, relaxing in the Library or gathering in the lobby. Acessible Rooms: Accessible rooms are available. Please notify request at time of booking. 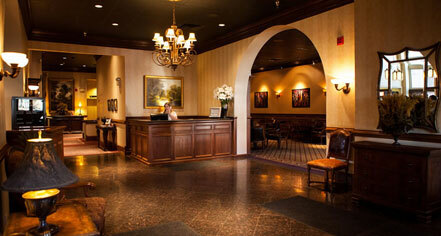 Cancellation Policy: By 6:00 pm 24 hours prior to arrival, penalty is one night's room and tax. Occupancy Restrictions: 2-4 adults depending on room type. Pet Policy: Service animals allowed: Yes. Pets allowed: Yes. Maximum amount: 3 dogs. Maximum size: None. Fee: $50.00 per stay, $25.00 for each additional animal. Other: WOOF! Welcome kit. Learn more about the History of The Blennerhassett Hotel .